The scene outside the front door at 7 p.m. But there, for what its worth, is a pretty good depiction of what is happening right now: it’s snowing, and there is more snow on the ground than there was when I photographed this scene at 4:00 p.m., but not a lot more. 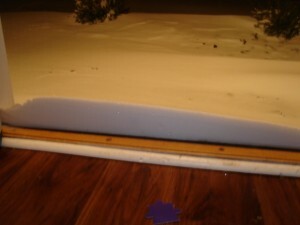 It’s pretty windy and drifting, so I also took a photo of the drift against the front door. It’s mere inches high right now, so I’m interested in seeing where it is by morning. If the fact that I am taking photos of minor snowdrift against the door isn’t enough of a clue, I’ll just state it outright: This is really a pretty boring thing right now. We might have snow thunder later, which might be cool to see, but I might well be asleep when it happens. The hour-by-hour forecast for my area now calls for the blizzard to really set in at midnight. 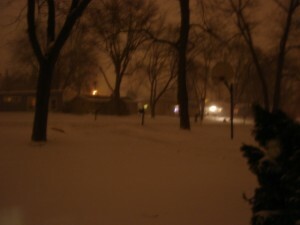 Yeah, so it’s really snowing here, and the wind has picked up. If you are commuting westward from the city, and en route, or have not yet left work, it’s going to take you a while. My daughter is commuting right now, just talked to her and she says she left Schaumburg at 2 and is now at the intersection of Army Trail and Dunham, just north of St. Charles. She beat most of it, but still ran into some whiteout patches where she could not see a foot in front of her car while on Army Trail. It’s a very rural road with not a lot to block the wind, so that’s a factor. Go home everyone. And go carefully.